Nubs is a shy, loving, talkative and very cat-friendly, three-year-old, golden-eyed male buff tabby cat looking for a loving guardian. This gorgeous cat lets you hold and snuggle him, and loves to be combed and brushed. While he's not much of a lap cat, he will seek out your affection with people and other cats. Once he's acclimated, he's perfectly relaxed in the home. 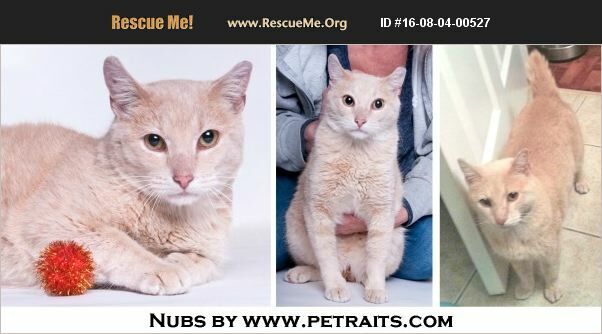 Nubs was rescued in the East Lawndale neighborhood of Chicago where he was thought to be a feral. A feline-lover fed him for a year outside before realizing that he wanted to follow her into her home. She has been fostering him inside every since. Nubs has all his claws but is very gentle with them. He's not a scratcher. He is afraid of loud noises, so he's looking for a quiet home without small children, and without dogs �'�| although he loves other cats! He is healthy, de-wormed, neutered, up-to-date on rabies and distemper vaccinations, micro-chipped, and virus-tested positive for the FIV virus. He can live with other friendly cats as he's a lover, not a fighter. FIV is only transferred through deep bite wounds. His adoption fee of $60 benefits rescued cats. To meet and possibly adopt Nubs please contact his foster mom Roni at roninakulski@gmail.com or 312-282-8699. He is currently being fostered in Chicago's East Lawndale neighborhood.